Here’s a little something I found interesting. Since it’s to us as well as “or Resident” I’d be happy to pass it along to anyone who is interested. Since there is no credit given to the origin of the pizza my mind naturally went to the guy who runs the crematorium. 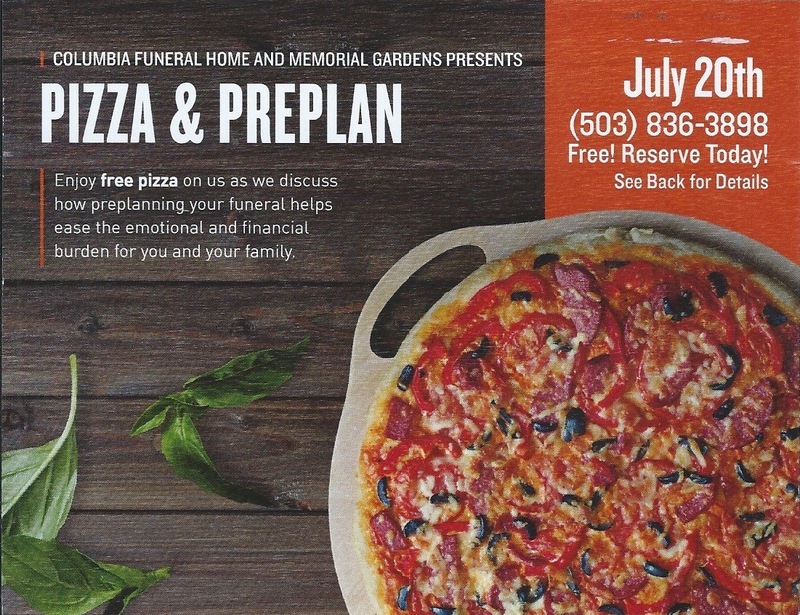 Might not eat pizza for a while, at least not at the local funeral home. First, I must tell you that I typically don’t watch the news and I rarely read the newspapers that are delivered to our door, so my news view is decidedly limited. Still, I have opinions about what I see when reading “Bing” news on my computer. Using that handy doorway to the world I’m able to choose from many sources for any of the news items they deem noteworthy. I have my favorites, of course, but tend to look at the most recent entries available. I suspect the trivial items are included to dilute ones perception of news in general to keep their interest. You know, like scattering candy in a pile of crap to make it look more festive. Take today, for instance. I’ve investigated the world and discovered that a “Popular Tucson TV Reporter Couple” have been charged with child abuse after their baby tested positive for cocaine. This was accomplished through the use of the former Miss Arizona contestant’s shapely left breast, while feeding her infant, after she ingested cocaine the previous evening. How fun. Now she’s newsworthy, but no longer reporting the news. Dumb. Then there’s news about a Milwaukee woman who has been added to the FBI’s Ten Most Wanted list. She’s the suspect in the murder of her pregnant neighbor and her unborn infant because of loud music. One source indicated that Shanika, the suspect, is Milwaukee’s first fugitive on the ‘Ten Most Wanted List’, like it’s some kind of honor, like when the Bucks win a ball game. Kinda makes you want to move to Milwaukee, doesn’t it? How about Mark Z, Mr. Facebook? He’s making all his new Kauai neighbors angry because he’s building a six-foot high wall around his 700 acre estate. That’s certainly noteworthy, don’t you think? His spokespeople said the wall is meant to be a sound barrier but I think it’s there to keep the wild pigs out. Or maybe keep them in. One resident of the island reported that she’s 5’8″ tall and when walking along the property all she can see is the rock wall instead of the Hawaiian scenery to which she’s accustom. They want Mark to tear down the wall because it’s an eye sore. I mean, really? It was built to code, using local rocks and, most likely, local artisans. I think it’s a nice looking wall. I also think a more simple solution to tearing it down would be for Mark to build platforms outside the wall, every 100 feet or so, where those who are less than 6′ tall can ascend above the wall and take in all of Mark’s natural beauty. Each ramp would have to have wheelchair access, of course. For the sports minded folks, there’s news about LeBron James who declined his player option and is now a free agent. The reason, I surmise, is due to his inherently greedy nature that propels him to seek more and more money for his “talents”. Yes, he’s pretty good but, like all pro sports icons, waaaaaay overpaid for what they do. Declining the option, it is reported, James salary will increase from $24 million to $27.5 million a year, a modest 14.58% increase. Not bad for someone who already has far more money than he needs. I know, I sound a bit bitter talking about stuff like that, and probably smacks a lot like socialism. That’s not really it for me. It’s just that I find it amazing that professional athletes, and most CEO’s make such obscene amounts of money each year when we severely under educated kids, many of whom don’t know what having a full belly is like. It’s just sad. There are many more topics, of course, most of them about people getting shot and places being blown to smithereens. You know, fun things to read about. The topper for all of today’s news, for me, was finding out that there might be a Tetris Trilogy in our future. I did. I fell down in quite a dramatic manner, as a matter of fact. I saved it until our friends, Les and Sophie, were leaving our home after a terrific visit. Les & Sophie spend a lot of time on the road in their almost classic Winnebago. Their unstated goal is to spend at least one night at every Elks Club parking lot in the nation. Diane and I, and a few other classic owners, have shared nights in Elks Clubs with them. Still, they are the King & Queen of Elks Club Camping. They are forever on the go and it’s always an honor when they land in our back yard, the St. Helens Elks Club, and pay us a visit. So, we sat and talked for a long time, catching up. Then they had to leave and I, being a good host, walked them out to their car. Diane did, too. At the end of our walk, next to the driveway, is a sprinkler head that used to spray on the garage door until I put a piece of plexiglas in front of it. Apparently I forgot it was there because when I tried to step to the driveway I kinda went through it. It made a resounding SNAP when it broke and sort of masked my shriek of terror when I realized I was heading for the asphalt. Times like that are very exciting for the main participant because they know they’re going down, and they know it’s going to hurt, and there’s absolutely nothing they can do about it. It’s a waiting game to discover how much damage is going to be done. Oddly, during those moments, time slows a bit for some of us, allowing us to adjust the angle of our unavoidable approach to the horizontal plane. The hope is the angle can be adjusted enough to allow a bit of roll and not land absolutely flat, which would be a bad thing. When I hit the plexiglas my approach to the driveway was unalterably modified. The plexiglas was aligned against the driveway curb at about a 45 degree angle, and the curb is about a foot high where I made my critical error. Stepping out with my right foot I hit the plexiglas about halfway up, snapping off the top half as my foot slid down toward the sacred flowers below my feet, over which I was trying to step. Since I had anticipated landing on the driveway with my right foot, I picked up my left foot as soon as my right foot made contact with the plexiglas so I was effectively in free fall for a short time. Leaning forward, I was, caused the most tender part of my right shin bone to make solid contact with the exposed cement curb of the driveway and my left leg didn’t land on anything because I put a lot of effort in to rolling to my left, away from the car toward which I was heading. My left knee made it to the driveway and I successfully rolled left onto my back and stuck my arms and legs straight up into the air demonstrating that what had just happened was an intentional act. A dumb one, but intentional. But it wasn’t. It was dumb, but it wasn’t intentional. So, there I lay, waiting for everything to start hurting really bad, but there was no immediate pain. Apparently enough adrenalin had been released that all the little tiny blood vessels in the skinned part of my injured areas were squeezed shut, and the pain receptors were disabled for a bit. OK … that’s just a stupid title, right? But, it was stuck in my head and the only way I can rid myself of things like that is to release it the only way I know how … just let my fingers do the talking. There’s an underlying motive, of course. I always have one or two of those. 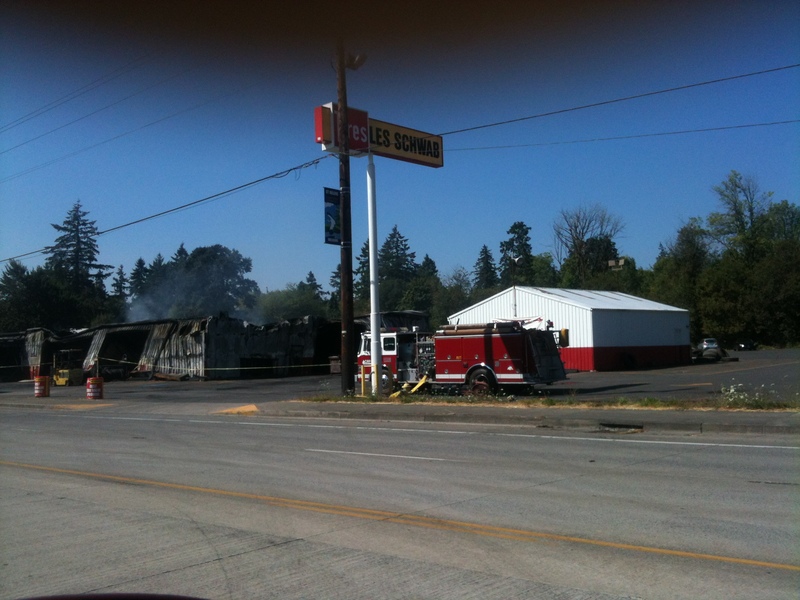 For this topic it’s the demise of the Les Schwab tire store in St. Helens, Oregon. It was quite spectacular. I was first made aware of the problem when I looked south from our porch and saw an incredibly huge, black column of smoke. Neither of us heard sirens, and we can normally hear them no matter where they’re going in town. If we had a police scanner we could have quickly discovered what was going on, but we don’t so had to use conventionally means. 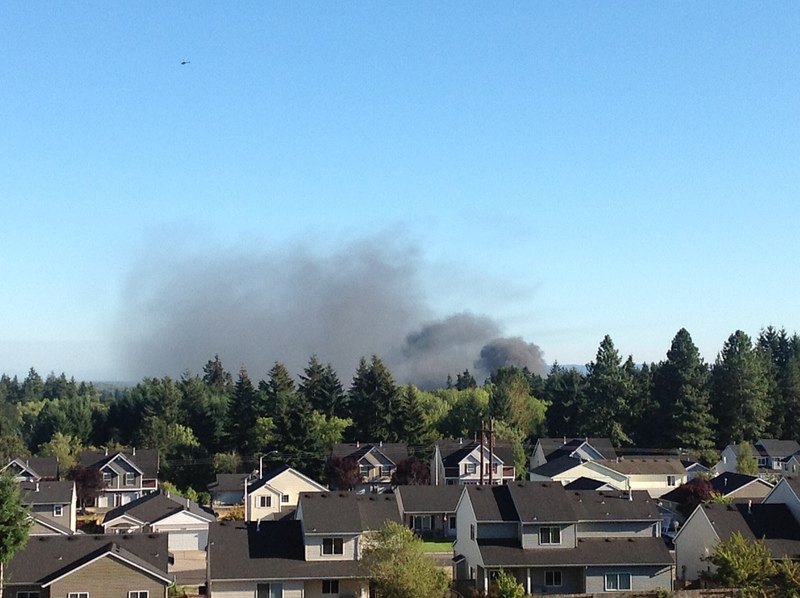 In this case, it was from the Channel 2 news helicopter from Portland. Diane was very concerned about Daniel’s & Jennifer’s home being involved because of the direction we were looking to see the smoke column. I was confident it wasn’t a house, however, because they cast off white smoke as a rule, not black. Still, she had to go look and told me that what she saw scared her to death. The plume of smoke was directly in line with their home but as she got closer she could tell it was farther out toward Highway 30. Before Diane departed on her investigative trip she speculated the fire may be at Les Schwab, but had to check. I don’t blame her. By the time she got home Channel 2 was showing pictures that confirmed the location. The entire facility was fully engulfed in flames and Highway 30 was closed to all traffic. The local power company had to cut power, too, because the flames were licking at the lines. Not good. Also, the road closure occurred in the middle of the annual Hood to Coast walk/run and all the walkers had to be re-routed. Just one thing after another. Local businesses have come to rely on the extra revenue created by the increase in traffic through town so re-routing the walkers/runners was a potential financial loss because of the extra folks hired, and the extended hours they worked. For example, Jennifer works at Safeway and was put on the midnight to 4:30am shift … our Safeway isn’t normally open all night, but this night it was because the Hood to Coast Runners were scheduled to come through at midnight. Due to the diligence, and hard work by the local firefighters, the blaze was extinguished, and the highway reopened to traffic before the the runners arrived, so everyone was happy. Everyone, that is, except Terry, the Les Schwab manager. We know Terry. I’ve been buying tires from him for many years. So the fire hit a personal note with us. 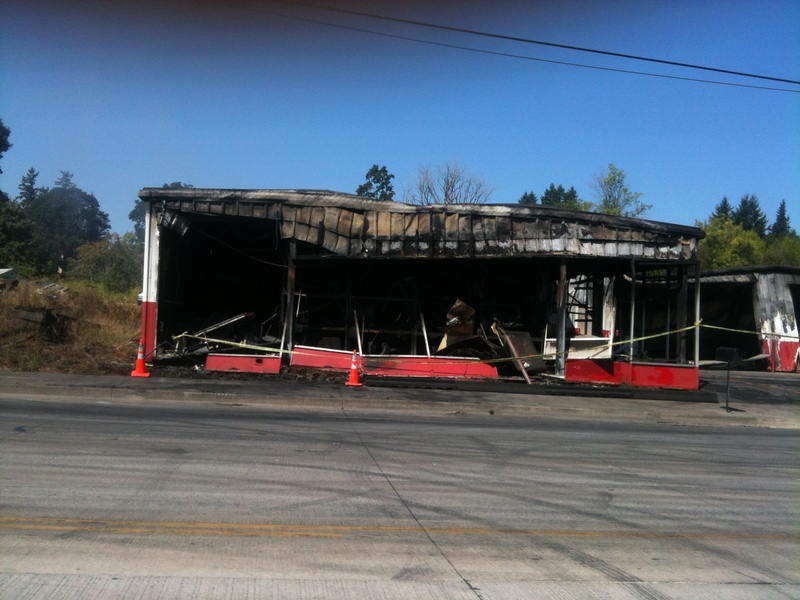 The entire store was lost, including 4 vehicles that were inside being worked on at the time of the fire. It was really, really bad. The only upside is that no one was injured. For that, we’re very happy. The only real downside for us is that I have a $100 credit on my Les Schwab account. I was going to take the old Chevy truck down there for new tires. Now I’ll have to wait until the Grand Opening of the new store when it’s rebuilt. I’m just guessing it’s going to be rebuilt, or course. We’ll see. Sorry for all the somber news, but that’s all I have right now. It’s not a subject that I can take lightly because of the huge potential for injury by all the firefighters and police involved with taking care of everything, as well as the financial loss by the store owner. No doubt they are insured, but it’s still tough to deal with. Now it’s time to quit and plan my strategy for helping them rebuild this thing because the truck really needs new tires. Speaking of the truck, I drove it down to Jennifer’s and Dan’s to pick up the remnants of a couple of bushes they cut down, and transport it to our burn pile. It took me two trips. During the process of cutting the branches down to size, I was stung by the one remaining bee from the nest they discovered a few days ago. I think I mentioned it in a previous entry. Now I have this nice welt on the back of my arm. Then, after transporting all the dismantled branches, I finished my trip through the front yard with “Grandpa’s Weeder” to remove all the dandelions I could find. Now the front yard looks like a combat zone … holes everywhere. I’ve been seriously thinking about fertilizing that yard one of these days. I’m told, by the owner of a computer I resurrected yesterday, that doing so would easily rid the yard of all the weeds, moss, and clover. So, here I am in Connecticut. When I left Portland this morning, it felt pretty good to have on my long sleeved shirt and jacket, and it was OK on the flight to Atlanta. Once there, however, things took a turn for the worse as the weather decided to get really hot. It was about 90 degrees there. When I boarded the plane for Hartford, most of the sweat had dried so it was just a thin crust all over my body. I was still a little wet so let the blower blow on my head and down the back of my shirt until I was dry all over. Then we got to Hartford. It was only 88, here. We arrived at 5:30, right on time. I was able to connect wirelessly while aloft (for $12) so I frantically searched for someone in Connecticut to extract me from the airport on arrival. Niece Susan responded saying she would do it. Then she went to a wake for a family friend and didn’t get there until about 6:30. She was, of course, extremely apologetic, which was entirely unnecessary because she was doing me a favor. I was grateful. I knew she was going to be late so I wandered around inside the airport for a short time, then went outside. It was 88 degrees. I immediately started sweating again, liquifying the crusty substance I obtained in Atlanta, and it started running down my back, into my pants. It was an unsettling feeling. People behind me were starting to talk. This gave me motivation to continue on out the door, into the sweltering heat. After about 45 minutes I stopped sweating, and was actually starting to become fairly comfortable, then Susan showed up and ruined it all with her air conditioned car. It was comfortable in Susan’s car. I stopped sweating, and we had a nice visit on the way back to Lyle & Ruth’s house. Just before we got there she said, “Oh ya. Grandma’s A/C quit working today but we put a fan in your room”, which caused trickles down my neck in spite of the A/C. But, that’s OK. I’m not here on vacation. I actually have a purpose. Really, I do. And, as soon as we walked in the door the significance of that purpose was made even clearer when we learned that Ruth had been taken to the emergency room by Martin & Sarah. Martin is Carol’s husband, and Sarah is the granddaughter emergency room RN. I may not explain all the names to you who don’t know these folks, so if you’re curious, just ask and I’ll answer. Honest. 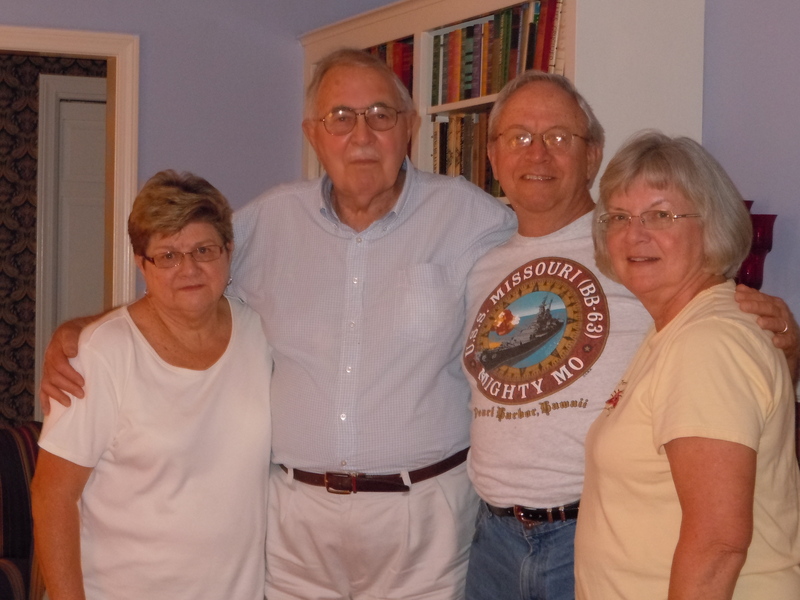 Upon my arrival, those in the house were: Cheryl, Allen, Carol, Heather, Laura, Larry, Valerie and three great grand children (one is Susan’s, the other two are Laura’s). I think that’s all. We all sat around the kitchen eating area and ate whatever the ladies put on it. It went well. It was the first meal I had today and it was really good. I ate a lot of vegetables, too. Every once in a while Sarah would call from the hospital to give an update on Ruth so we were able to follow her progress through the emergency room process vicariously. They thought for sure she has a UTI, but they were waiting on labs from the results of the phlebotomist’s efforts, and they were scheduling a CT scan. It didn’t sound good because of all the stress and trauma she, and everyone else, has endured over the past few months, and especially the last few days. Finally the CT scan was done and it was determined that Ruth has diverticulitis. She’s coming home with a box of meds, and strict instructions to be good and rest. That’s going to take some serious discussion because Ruth will not rest until all the details are in place. Having heard the news, and learning the diagnosis, everyone went home to well deserved rest. So, I am alone in the house, waiting for their return. At this moment it’s 11:11pm. I’m sitting in Lyle’s place at the table, where I’ve been all evening, and now that the voices are gone, I can hear Lyle’s voice above the din of the quiet, calling my name in order to tell me something, or laugh about something someone said. He’s at the kitchen sink rinsing dishes, and getting things ready for tomorrow.If I were to go into the basement I know I’d see him sitting at his computer playing solitaire, or saying, “Jerrie, come’ere. I want to show you something.” So, I go, and we share memories, and anecdotes until that memory fades, and I’m called to another place in the house where he lives in my mind. My big brother, Lyle, is having a difficult time and is currently incarcerated in a hospital in Connecticut. He could have made things a bit easier by choosing a hospital a little closer to us but that apparently wasn’t an option. The diagnosis is colon cancer composed of 3 masses. Lyle is 87. Please send good thoughts toward the East Coast. No picture for today because we didn’t do much. Just lounged around in our jammies until afternoon. Ate breakfast around 1000 and the maids visited us to clean at that time so we visited with them while we ate. It was a joyous event. I ate four eggs and about nine pieces of bacon and a pound or two of potatoes. It made me extremely full. I wouldn’t have voluntarily eaten that much but Diane’s back in the mode where I have to eat whatever she doesn’t want, even after she’s taken it all by herself. Being an extremely good husband I, of course, do what she tells me even if it means I will probably never, ever, be able to wear my 36″ waist pants again. Ever. So, while we were out we dropped by a local Goodwill and got me another pair of 38″ jeans. Now I won’t have to run around in my underwear any more. Most of our time outside today was spent along the Carlsbad and Oceanside seaside. While traipsing around one of the yacht basins we stopped at a little coffee shop to pay way to much for some of the worst coffee we’ve probably ever had in our entire lives. In the lingo of the land, it was pretty gnarly. I drank mine out of spite, but Diane couldn’t finish hers. Thankfully, that’s the one thing, today, that she didn’t make me finish. Thank goodness. I’d’ve never made it through two of them. Tomorrow we’re going back to San Diego for another lunch buffet. Seafood this time, and we’re meeting with another DD-808 shipmate to do it. Tonight is going to be a challenge because our new next door neighbors are young, very noisy, and spend a lot of time on their balcony, going in and out of a very noisy sliding patio door. If they don’t drop the noise level in the next 20 minutes (2200) I’ll have to take my life in my hands and go bang on their door to ask for a little peace and quiet. Either that, or take my sleepy meds.